Humans are a storytelling species. Anything else that may set us apart from our fellow earthlings – our art, technology, industry, government, science, spirituality, and personal life – is made possible only as part of a larger endeavor in constructing meaning. As one of our ultimate concerns, making meaning through storytelling is how we orient ourselves in reality, open up new possibilities, find strength in adversity, come together for fresh solutions, or drive ourselves to extinction. In a recent post entitled Above Us Only Sky I introduced the imaginarium of belief as the place where stories are born. It’s also where those interesting characters of a particular kind of story known as myth enter our world. I don’t claim that god literally exists out there and apart from our imaginations, but that god’s existence is literary, as a figure in narratives that tell of our origins and destiny, of our place in the cosmos, and what we have inside ourselves still to discover and awaken. I understand that such a statement may sound heretical and blasphemous to those who have been instructed to take the stories of god literally and who believe in a literal (factual, metaphysical, supernatural) deity. Even though they have never encountered a separate deity – and we need to carefully distinguish this from undergoing certain experiences and attributing them to an idea of god they have in mind – the expectation is that they should persevere in believing such, as this adds merit to their faith. As religion insists on the objective truth of its myths (or sacred stories), any hope of restoring an appreciation of their genuine significance recedes. We might be tempted to review every myth for its deeper meaning, and in some cases it will be worth the effort. But rather than committing ourselves to such an exhaustive review, which would take a long time and carry us across a wide diversity of cultures, I’m taking the option of remembering what you may have forgotten. Once upon a time you played in storyland and every feature of your life-world had roots and branches in its magic. It’s conventional these days to regard the myths of culture and the fantasies of childhood as amusements we’ve outgrown. As modern adults we need to put aside stories that don’t connect us to reality, and focus instead on straightforward descriptions of the way things are. Our preference is for theory over myth, since theories are explanations of objective facts we can count on. It doesn’t matter where you’re from or what mood you happen to be in today; a valid theory is true regardless. In fact, the theory is true precisely because it has methodologically excluded the idiosyncratic factors of personality and perspective. This virtue of an absolute truth outside our human experience is what seduced religion into confusing its own stories with supernatural journalism – as an objective reporting on revealed facts, metaphysical beings, and historical miracles. Once this move was made, the validity of religion as a system for the activation and development of spirituality was almost entirely lost. Religion has consequently become depleted, defensive, regressive, and irrelevant. My hope is that as we individually recover an appreciation for the mythopoetic imagination and its stories, our perspective on religion and its future will brighten as well. We’ll see. In Whole Picture, Whole Brain I proposed that meaning is the product of two parallel processes working together: communion (based in the right hemisphere of our brain) and knowledge (based more in the left). A deep rootedness in reality (i.e., communion) or an objective understanding of reality (i.e., knowledge) is insufficient in itself to make our existence meaningful. We need the contributions of both sides – communion and knowledge, embodied contemplation and detached observation, stories that reveal (myths) as well as stories that explain (theories). As these two storytelling processes (right-side myth and left-side theory) work together, they deepen and expand our experience of meaning, as well as empower our creative authority as meaning makers. As we mature into adulthood and our belief system needs to become more realistic, responsible, and relevant to the daily concerns of public life, the challenge is not to lose our sense of communion with reality and its integral wholeness. Whether a particular belief identifies and explains something in objective reality or reveals and expresses something from our deeper experience, our method for determining its truth value will be different. A story about god, then, might be scrutinized for its factual accuracy or contemplated for its metaphorical depth. In the first case it will be rejected for lack of empirical evidence, while in the second it might open new insight into a mystery that can’t be isolated and defined. Since the Western mind has been moving steadily toward the mastery of knowledge and away from the mystery of communion, I will devote the remainder of this post to clarifying what the mystery of communion is all about. Let’s drop down from the imaginarium of belief in my diagram and begin where it all starts: in the stream of experience where each of is every moment. It would be easy to assume that the ego – your prized center of personal identity – is immersed in this stream, but not so. Ego lives inside the imaginarium of belief, caught in its own delusion of separateness. (This delusion of separateness is an important phase in your self-actualization as a human being, so long as you are enabled to transcend it in higher experiences of inclusion, wellbeing, and wholeness.) To enter the stream of experience, you must surrender the center of who you think you are. This, by the way, is the path of mystical descent practiced across cultures and often against the orthodoxy of (particularly theistic) religion. The goal is to steadily unwrap the constructed self (ego) of every last label identifying “I, me, and mine,” until nothing is left but boundless presence – not “my presence” or the presence of something else (like a god), but the present mystery of reality. To arrive at this place of deep inner calm you will have to first sink past the delusion of who you think you are, descend the electrochemical web of your sentient nervous system, deeper into the ancient biorhythms of your animal body, and finally pass through the trough of the wave to a silent stillness within. You need to be reminded that you are always already here, and that this inner clearing of boundless presence awaits you even now. We moderns are so much into the management of identity (who we are or strive to be), that we have forgotten the wellspring in the depths of what we are, as human manifestations of being. Our essential nature is in communion with reality, while our conditioned self (ego) is separated from it. When you were very young, the stories that shaped and inspired you were less concerned with objective reality – simply because your separate self had not yet been established and there was no clearly objective reality. What made these stories so compelling for you had nothing to do with factual accuracy. They were compelling by virtue of their metaphorical profundity, where profound is in reference to containing deep insight rather than intellectual sophistication. The characters of story were metaphors – vehicles, mediators, and catalysts – of the immersive experience in which you took such delight. Such an immersive experience is another name for what I mean by communion. Again, when you were a young child, these imaginary and metaphorical beings were spontaneously appreciated for their power. But on the other side of childhood (specifically after age ten) your perspective on these stories and their characters began to shift more toward the left brain, which is the hemisphere with greater investment in the match between words and their objective referents in external reality. From that point on, theories (as explanations) became more important to getting on in the world than myths (those revelations of inner life). The challenge became one of contemplating those same fictional characters in conscious acknowledgment of their metaphorical nature. They are still capable of facilitating the mystery of experience into constructs of language (meta-phorein means “to bear across”) – but now you have to look back down through them in order to catch the insight at their roots. And this is where we are today with respect to the myths of religion. The sacred stories that once carried our spontaneous experience of communion with reality began very naturally to lose their enchantment. 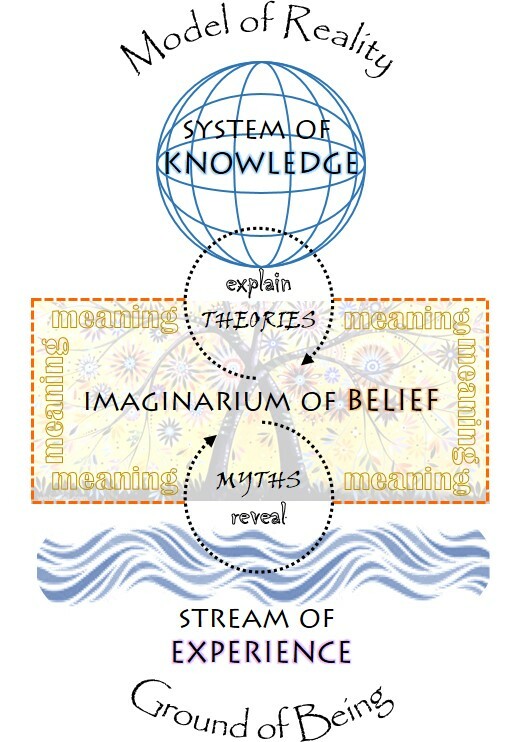 Which put believers on the horns of a dilemma: either reluctantly give up on the myths and leave them behind for a more adult engagement with reality, or else insist on their literal (i.e., factual) truth and consequently reject many well-established theories in the contemporary system of knowledge. Unfortunately, not only have a large number of theistic believers gone with mythological (or biblical) literalism, but metaphor-blind leaders have encouraged and even insisted on it. Back one more time to the imaginarium of belief, where our knowledge about reality and our communion with reality intertwine (without fusing into confusion) in our constructions of meaning. Theories alone or myths alone are not enough for the important work to be done. We need them both, which means that we need to brush up on our creative skills as storytellers. Theology is reasoning (from logos) about god, or simply the study of god. Even simpler, theology is our theories about god, how we talk about god, the words we use to make sense of god. Theology is god-talk. If there is a clear distinction between religion and spirituality, it comes down to this business of talking about god. While religion involves doctrines and prayers, confessions and apologetics, scriptures and commentaries, commandments and formal teachings, spirituality is the quiet contemplation of living in the presence of mystery. To say “of mystery” is only a concession to the requirement of our minds to give “it” a name. The primary business of the mind is to make meaning, and it does this by dipping its bucket in the living stream, whereupon the dynamic and moving mystery that is the stream gets captured, extracted, isolated and contained. The stream in a bucket: you just have to hear that a second time to realize how ridiculous it sounds. But if we’re going to reflect on our experience of mystery, make sense of it, and communicate it to others, we have to understand that we’re dealing with buckets and not the stream itself. Buckets are used in meaning-making. The stream is prior to meaning. It is there – but “where,” exactly, can a stream be said to be? – after we walk away with wild mystery still sloshing out and onto our shoes. It’s not easy to admit, but mystery is outside of meaning. In a word, it is meaningless. By naming it “god,” we instantly catch the mystery into a system of human utilities. God becomes useful for explaining how things came to be, useful for orienting tribal values and concerns, useful for motivating “proper” behavior. At some point (though interestingly not very early in the history of religion) god became useful for saving the soul from the ravages of time and the consequences of sin. Religion, then, might be seen as this system of utilities whereby our experience of mystery is made relevant and useful to our needs (both genuine and neurotic). Metaphors germinate into myths, myths inspire rituals, rituals expand into moralities, and moralities give cohesion to tribal life and shape our identities. In this way we channel the mystery into meaning and make our worlds. The metaphor of a bucket is a helpful one, I think, when trying to understand the relationship between spirituality and the variety of ways it is “put to use” as religion. The fact is, not everyone’s religion is that close to the stream anymore. We’ve taken our portions far inland, deep into our tribal life – or rather, our ancestors and forbears did a long time ago. What we have are not so much buckets of water as boxes of belief that have been passed down through the generations. Our theological property is carried and “handed on” from one generation to the next; this is the dictionary definition of the word tradition. We have our “god boxes” that contain theological portraits drawn from the metaphors, myths and commentaries of our tribe. Christians, Jews, Muslims, Buddhists, Sikhs, Pagans – all of us inherit the boxes that represent our patron deity. Or if that name is too limiting, then the focal principle or personality around which our world of meaning is arranged. In Tractsofrevolution I have been advocating for the need to move beyond (post) our gods and return to the stream for refreshment and perspective. This isn’t a “fundamentalist” return to the way it used to be – which is really the way we never were – but a circling back to the origins of religion in the experience of mystery. My argument is not for breaking the idols and doing away with god, but for keeping an “open-box theology” as we work to construct a world where we can live peaceably together. An open box is still a box. Not to be confused with atheism, post-theism acknowledges our human need to make sense of the mystery. Furthermore, there is a critical correlation among ego, tribe and the mythological god that is necessary for the healthy development of identity – or so I have argued. A tribal representation of god serves the important developmental role of giving security and validation to the tribe’s present existence, as it inspires and attracts (in the way of an evolutionary ideal) the latent potential of a still higher humanity. An open-box theology can understand this – or at least it is open to dialogue about the implications of saying that our gods are really just part of a larger experience and a longer adventure. Closed boxes, on the other hand, are like IEDs along the evolutionary road of humanity. They no longer connect the true believer back to the living stream of this present mystery. What energy they do seem to have is not animated from inside, but rather charged from without by the fervent devotion of “the faithful.” What they lose in relevance – as they must with the passing of time and the progress of humanity – they gain in conviction. Religion shouldn’t be about “convicting” people (making them convicts of belief) but liberating them, opening them up and moving them forward. Open-box theology allows that to happen by keeping us engaged with the here-and-now, which is where we will rediscover the real presence of mystery, the living stream of an authentic spirituality. Post-theism, like postmodernism, is not merely asking about what comes “after” god or modernity. The “post” prefix here is seeking after what is beyond these crucial stages in our life on this planet. We can’t just throw our gods to the side or abandon the values of critical reason, self-reliance, and personal responsibility. We need to consider what they have prepared us for. How can we leap from this stage into the next creative phase of our evolution? Whatever the next phase is, we know it will require a new and more enlightened sense of community – with each other, with the earth, with our separate pasts and our future selves. If Paul Tillich has recognition in popular culture it is probably for his term “ultimate concern,” which can refer both to the object of one’s highest commitment as well as to the subjective degree of devotion one has for it. The reformer Martin Luther made a similar claim back in the 16th century, when he defined “my god” as anything to which I am passionately and unconditionally devoted. Devotion, in the way it fuses feeling and behavior, elevates its object to a supreme position of value and inspires sacrifice on its behalf. As a “formal definition of faith,” Tillich says that the object of ultimate concern is really secondary to the meaning it has for the believer. That sounds right: We have witnessed many wacky cults and fanatical sects that inspired their members to forsake the world and surrender their fortunes, strap bombs to their bodies and murder innocent civilians, or willingly take poison to end their lives for a better gig on some other planet or higher plane of existence. These true believers, however deluded, were filled with “ultimate concern” for the one thing that mattered most to them. But what about truth? If something is entirely lacking the evidence to support it; if it contradicts logic and violates rationality; if it inspires a believer to commit violent acts against self and others – then when does it begin to matter whether or not the content of faith is true in a more objective and publicly verifiable sense? According to Tillich, faith is not a guarantee that the object of one’s ultimate concern is valid, worthy, or even real. The protection of religious liberty and the separation of church and state in American democracy allows an individual to put his or her faith in any and every kind of nonsense, so long as it doesn’t endanger others or encroach on their freedom not to believe, or to believe differently. Once upon a time, when we were all metaphysical realists and simply assumed that religion’s ultimate concern was an actual entity separate and apart from us, we could entertain this question of truth in a spirit of quiet confidence – knowing that, in the end, the “real god” would be revealed. Those poor suckers who chase after comets, take dictation from ancient spirit-beings, or steer jetliners into skyscrapers will wake up before the judgment seat of the One True God – ours, of course! However meaningful their lives had been for all the passion, certainty and invested focus, they had put their faith in lies. They probably hadn’t read their Bible, which tells us everything we need to know about the real God – the one who made the universe, sent his son to save us, and will one day catch us up into heaven or throw us down into hell. Too bad for them. Metaphysical realism – belief in the actual existence of a nonphysical god – is itself a necessary corollary of mythological literalism, which takes the stories (or myths) of religion at face value. Whereas early cultures seem to have appreciated how the ritual recital and reenactment of a myth could transport participants out of the “broken time” of ordinary life and into the “deep time” of archetypal life, modernity encouraged a more detached reading of the stories, which then forced a critical distinction between fact (what is actual) and fiction (what is only imaginary). What are we to do with these stories? Unless we are ready to admit their metaphorical status, the only choice we have is to either take them literally or dismiss them as “art” (or lies). Obviously, our stories must be based in fact while the myths of other religions are – well, myths. The Bible is literally true and its god actually exists. You either believe it – and believe all of it – or you don’t. The interesting thing is that we don’t really believe it; certainly not all of it. We just lack the courage it would take to give up and get past our need to believe it. For many today faith is caught in a loop of irrelevancy. God exists because the Bible says so; the Bible is true because it’s the word of God. Giving up a literal Bible (mythological literalism) would be giving up on the real God (metaphysical realism), and there’s too much at stake to even consider it. So we settle for a god of our own making, an extraction from the countless masks of God in the Bible, selected and modified to fit our needs. Whether you need security or fulfillment, control or freedom, forgiveness or vengeance, power or love – there’s a god in the Bible waiting for work. Whether we get it more or less right, we try to make up the difference in faith, passionately believing where we just can’t be sure. If we put enough energy into our devotion and make a big enough sacrifice on its behalf, our “ultimate concern” will be rewarded. Suddenly faith becomes dangerous. But what is life without it?